My parents and I were seated and presented a glass of prosecco with a sleeve of pastel-colored rice-puff chips. During the course of the meal we sipped on a bottle of Brunello di Montalcino while Sexual Healing played for all the patrons to enjoy. We ordered the appetizer sampler, but I’m pretty sure we got a lot more than just that and already I’m confident this will be quite a show. In a tiny shot glass we had whipped gorgonzola foam with sesame seeds, and a thin sugar cookie on the side. For lack of a better culinary term, it was da bomb. Next up was the buffalo mozzarella, prosciutto, fried artichoke, broccoli rabe, and eggplant caponata. Each of us was presented a puff pastry stuffed with prosciutto and cheese. Then, arancini (mini rice balls) with truffle, and a caramel consisting of more – you guessed it – prosciutto and cheese (this time, taleggio). It was getting harder to polish off each plate at this point, so as the waitress started taking plates away we requested to keep the mozzarella around for a bit. Never waste fresh mozzarella, especially in Italy. After a 20-minute breather, we regain the strength to continue on this food journey, but our entrees are nowhere to be found. I notice the attentive staff waiting in the distance and watching us. Suddenly it occurred to me that they are waiting for us to finish that mozzarella chunk before they continue feeding our fat souls. As I suspected, the staff was back up and running to serve the main course as soon as we cleaned our last plate. 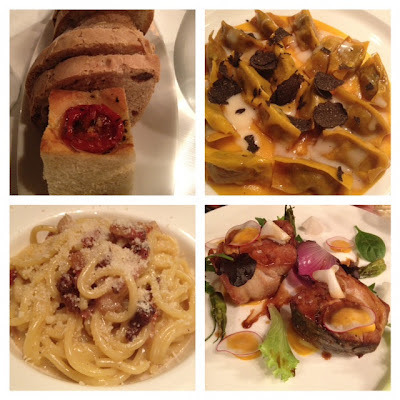 Out comes the pumpkin ravioli with black truffle shavings, spaghetti carbonara, and the "pigs in the garden". I expected the ravioli to be filled with pumpkin, however there was meat inside and the pumpkin was present in the sauce. Still, very good. To conclude our shamefully delicious display of classic American gluttony, they offered a glass display of fudgy chocolates to pair with our round of grappa, compliments of the manager, Renato. Another successful dinner in Rome! I will be traveling to Rome soon, this sounds perfect for a special celebration with the family!